Rose often goes to MCC to educate workers about their rights. Since she considers herself lucky compared to the others, she dedicates her free time to improving the lives of those less fortunate, running workshops on resilience and union meetings. Here, she takes a breath between meetings. Amy, Rose, Delphine, Bella and Mirasol are domestic workers. They moved to Lebanon from Philippines and Ivory Coast to make money to provide for their families. Yet, since the country does not guarantee the rights of these migrants, they often find themselves in an insufferable situation: working long hours with limited freedom. Sunday is their only day off; that is, for the luckiest ones. 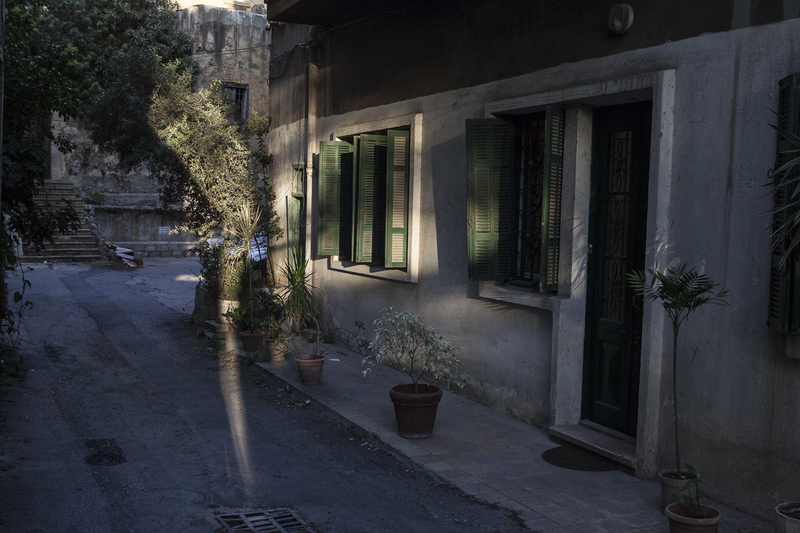 Reporting on the situation, Adrienne Surprenant sought to understand what they do on their day off and what they know of Beirut, a city some have lived in for decades. A photo essay produced in September 2015. “The predicament of domestic workers in the Middle East, including Lebanon, is rather well-accounted for: under the kafala system, women hailing from the Philippines, Ethiopia, Cameroun, Sri Lanka and the likes attend to the wishes of their employers without necessarily having guaranteed rights. For example, even if Sunday is considered to be a day of rest, it isn’t so for all. If they disobey orders, they risk loosing their job and their status. In the media coverage, these housemaids are often presented as victims. The reality is much more complex. Though it is true that they lose their independence and face abuse of all kinds, they also become, by the same token, their family’s breadwinner. This dichotomy explains in part the persistence of that economy. I wanted to treat the domestic workers, not merely as slaves, but also as accomplished women who fight, who each have a unique character, a past and dreams. I wanted to understand why they accepted their fate and how they grew as individuals in that context. How do they make friends? What is their daily life like beyond their employer’s walls? 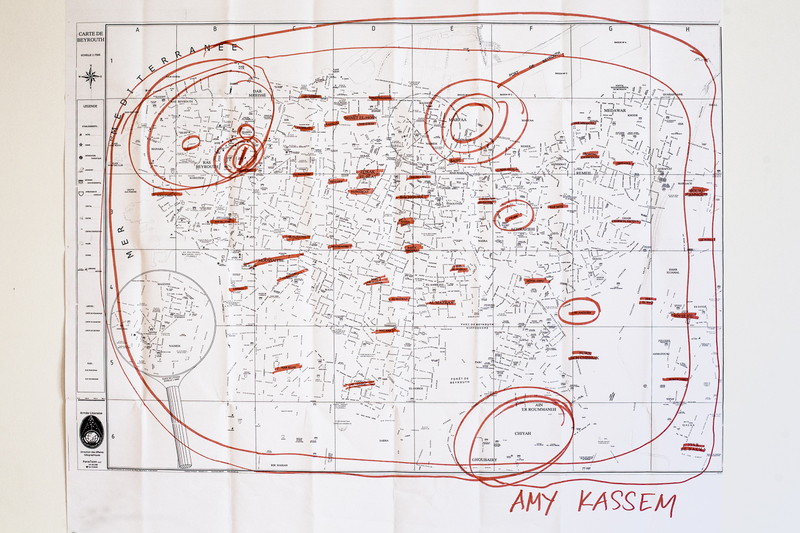 Map marked by Mirasol, 35 years old, who works for Amy 14 hours a day, 7 days a week. She’s paid $350 per month. Since she doesn’t have the time to explore the city, she fears the neighborhoods she doesn’t know, e.g. most of Beirut. Mirasol came to Lebanon to pay for the education of her 3 children. 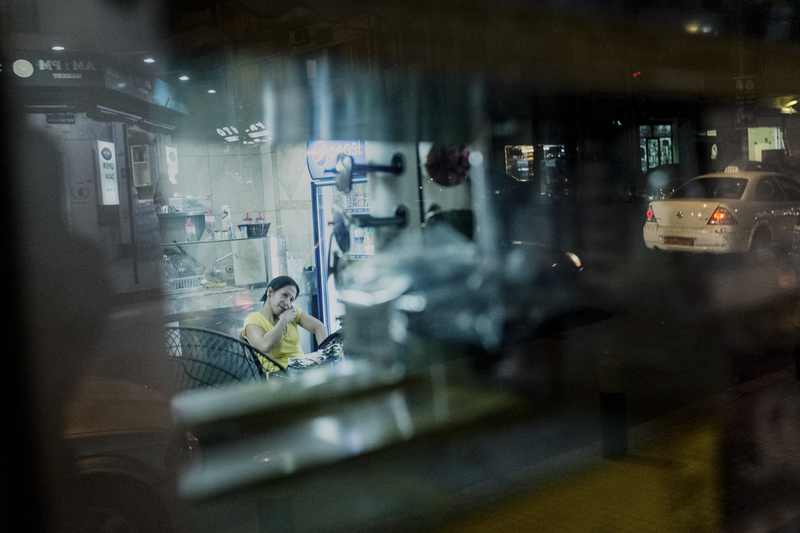 After 7 months as a domestic worker, she learned that her husband was using the money she was sending home for his personal pleasure and that he became enamored with another woman. She has since cut ties with him. 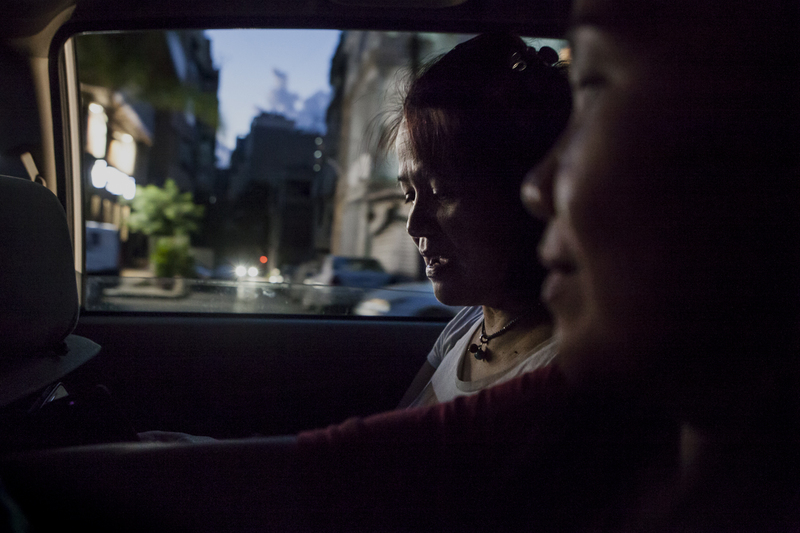 Sunday, the day off for a growing number of domestic workers in Lebanon, is the hardest day for Mirasol. Up at 2:30am, she cooks so that her employer can welcome those who are off around noon. To feed all those mouths, she installs additional gas cookers in the room where she sleeps. On Sundays, the restaurant fills up, and Mirasol runs left and right to prepare over 10 traditional Filipino dishes, leaving her with a big headache. Mirasol has had no days off since she started working in Lebanon. Her only time off was when she was able to see her 3 children between two contracts. 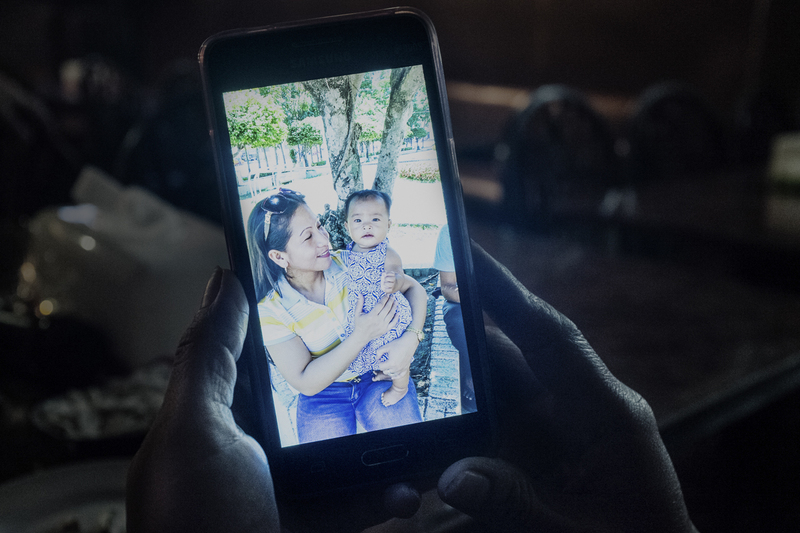 The picture on the phone shows her in June 2015 with the young daughter of her eldest, Myra, 19 years old and already married. Almost all of Mirasol’s social interactions happen within the restaurant where she works from 7am to 9pm and atop of which she sleeps. Still, she managed to create friendships, and even a few furtive love affairs. “I try to be nice to everyone, so they’ll be nice to me,” she says. 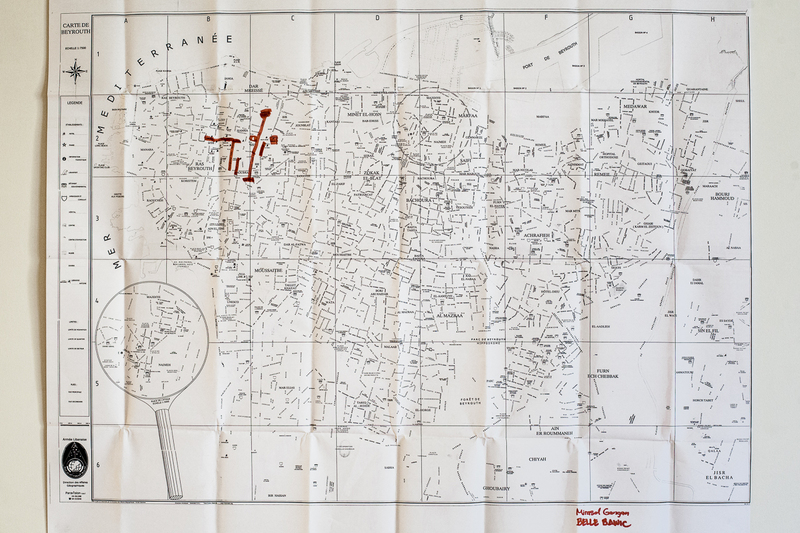 Map marked by Amy, 55 years old, one of the pillars of the Filipino community in Beirut, where she has lived for 28 years. She divorced her Lebanese husband who confined her at home, and now spends her time between the shipping company she works for and the restaurant she owns. Paradoxically, this defender of the emancipation of Filipino women refuses to grant Mirasol, her employee, a day off. When she arrived in Lebanon, Amy wanted to continue her business studies. Her young husband, who saw no future in that endeavor, only allowed her to take nursing or housekeeping classes. Today, Amy works in a company that delivers parcels sent by Filipino migrants to their families back home. Free to come and go, Amy takes a taxi to go back home. Amy’s daughters are married, one to a Lebanese man, and the other to a Palestinian. They are totally integrated into Lebanese society, to the point of having abandoned the Tagalog, their mother tongue, in favor of Arabic. 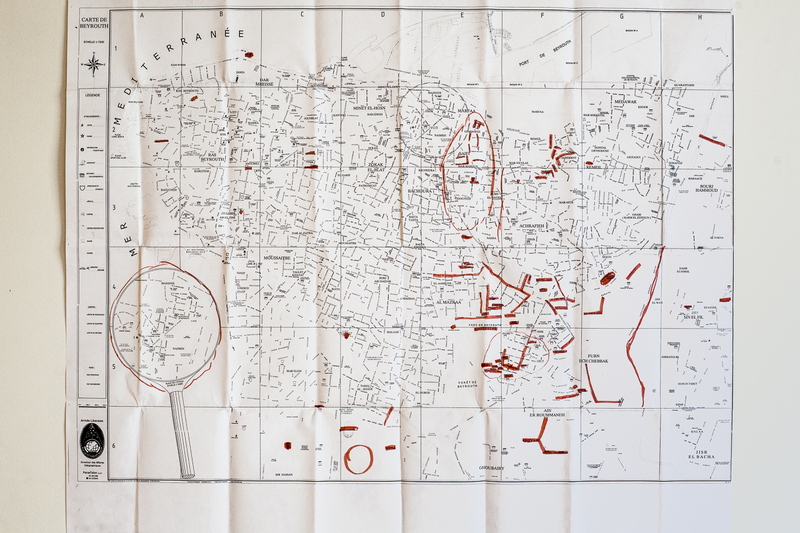 While thinking about how to showcase the variety of experiences these women face and how to address the issue of freedom, the idea of using maps emerged. It’s quite revealing to have them draw the places they know on a city plan. Mirasol, who works non-stop, knows only a few street cornes. Meanwhile, Rose, who fights for housemaids’ rights, knows all the embassies. Their personality also comes through. Bella, a keen and dynamic 31 year-old, drew squiggles, while Rose, who’s very organized, made neat circles. My experience has been quite different than most. I’m one of the lucky ones. The family that hired me was, let’s say, good. It was not rosy every day, but I knew how to impose my views. Gradually, I got to do what I do today: speak for those who can’t. “I’ve always wanted to address the issue of domestic workers, but I let it linger because I wanted to avoid treating it in an unfair manner or repeat what’s already been done. Adrienne’s proposal of approaching the subject by mapping out their freedom of movement and capturing their daily life in the city was original and innovative. 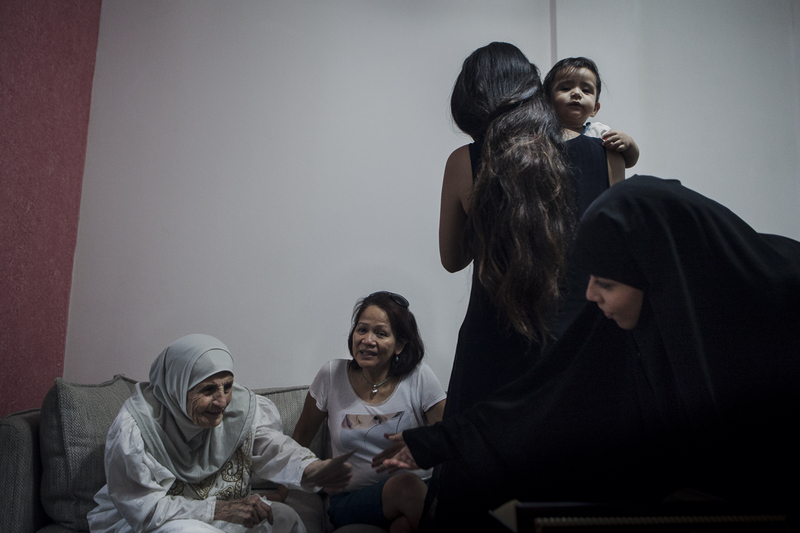 The situation of domestic workers in Lebanon is similar to that of foreign workers in the rest of the Middle East: most are recruited by legally dubious recruitment agency and once in Lebanon or in the neighbouring countries, they are stripped of their most basic rights. Within the kafala system, they find themselves under the thumb of their employers, who often have paid a substantial sum of money for them and, therefore, intend to capitalize on their investment by making them work long hours for a pittance. Living in the home of their employer without a proper employment contract, they can be subjected to Herculean labor, mistreatment or abuse. In the most extreme cases, some commit suicide after years of slavery. On the flip side, some workers are welcomed by liberal families who let them take days off, participate in union activities and live their lives as any women would in Lebanon. Overall, the situation is gradually improving. But, their exclusion from the labour code and the prevalence of the kafala system continues to threaten their fundamental rights. 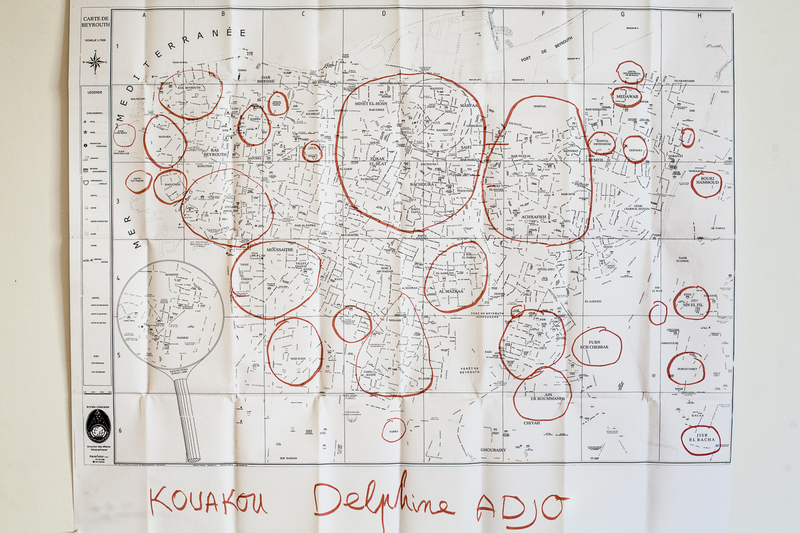 Map marked by Delphine, 44 years old. 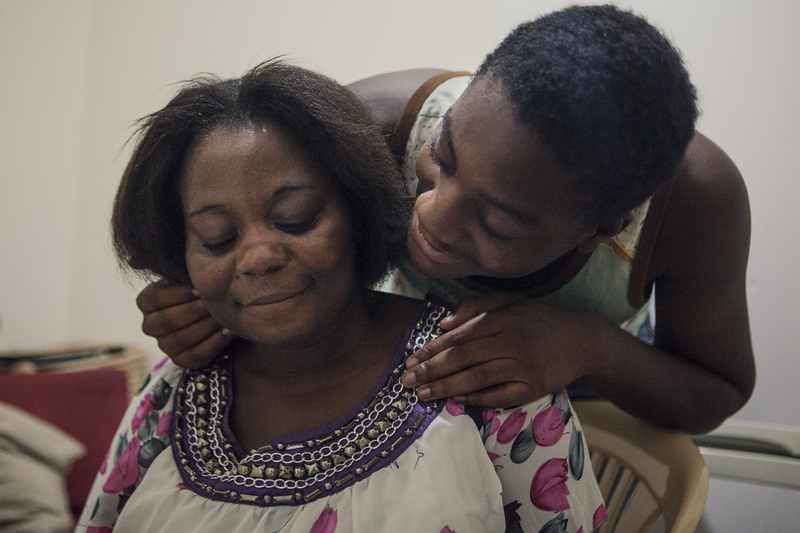 Originally from Ivory Coast, where she started babysitting the children of a Lebanese family at 13, she followed them to Lebanon when they decided to return, even though the country was in the midst of the civil war. 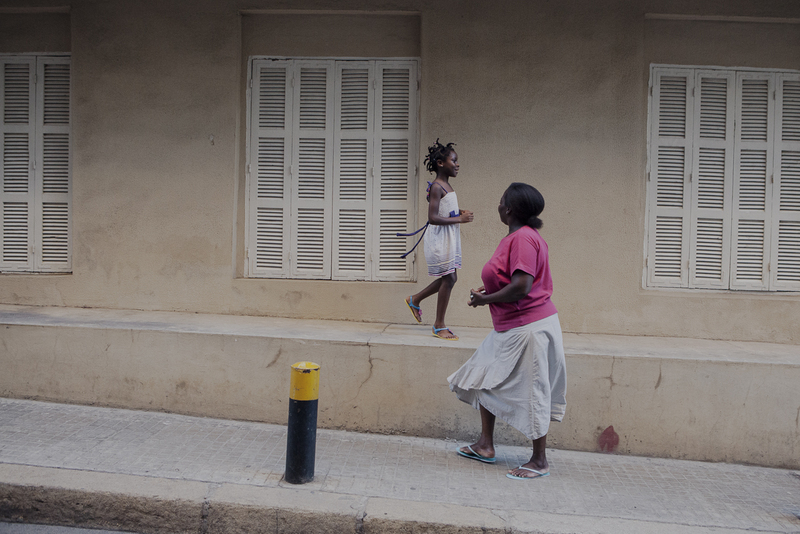 Every summer evening, Delphine walks down the same roads to pick up her daughter, Sarah, from the day care at the Migrant Community Center (MCC) in Beirut. On the road between the MCC and the place where Sarah sleeps, Delphine ‘s daughter tells her mom about her day. Delphine has two children without documents, their respective father disappeared before she gave birth. Ochinga kisses her mother on Saturday evening, when they’re reunited. When Delphine gave birth to Ochinga her boss did not want her to breastfeed at work. She loss her job for three months and had to beg to be rehired, and only on the condition that Ochinga be entrusted to a nanny. Map marked by Rose, 45 years old. When she arrived from Cameroon 29 years ago, she had the chance of being hired by a boss who respected her. For the past 2 years, she has been the vice president of the domestic workers union. Many of the annotations are embassies, which she often visits as part of her social commitment. After spending 13 loyal years serving her boss, Rose is now self-employed. She uses her free time to defend the rights of migrant workers. Here, she spends a Saturday afternoon in a union meeting. Returning from her many daily activities and obligations, Rose likes to stop at a Cameroonian neighbor and friend who named her daughter in her honor. Rose’s children are back in her homeland. 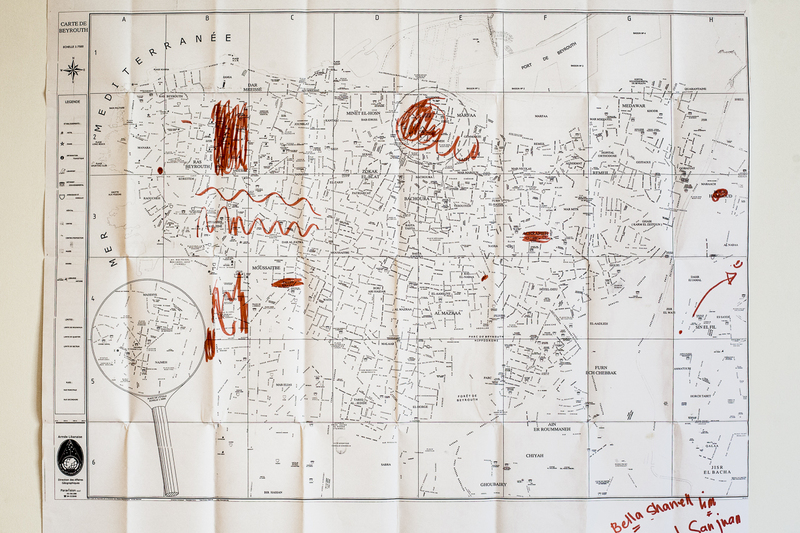 Map marked by Cecil Donjuan, nicknamed Bella, 31 years old, and the mother of 3, She has been a domestic worker in Lebanon for over a year. She became the head of her family after her husband disappeared for two years. 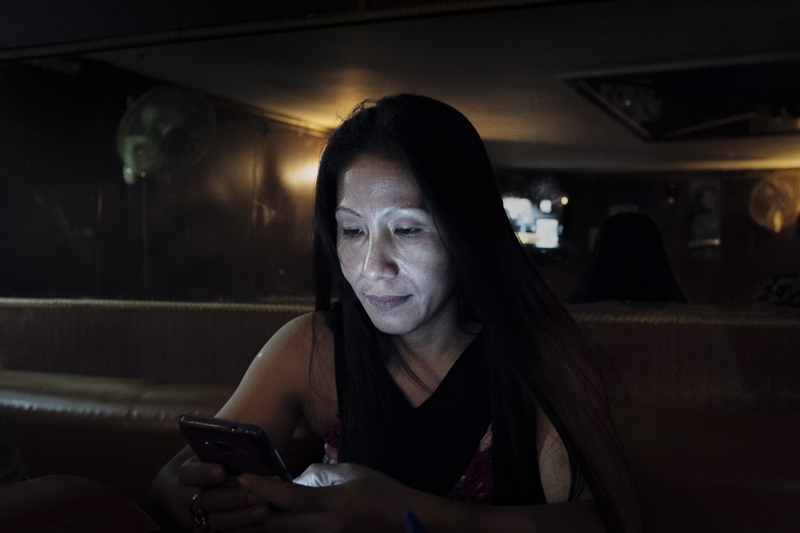 She earns $250 a month and only sees her children through social networks. Every Sunday, the Filipino community gathers in Hamra for parades, competitions, and various celebrations. 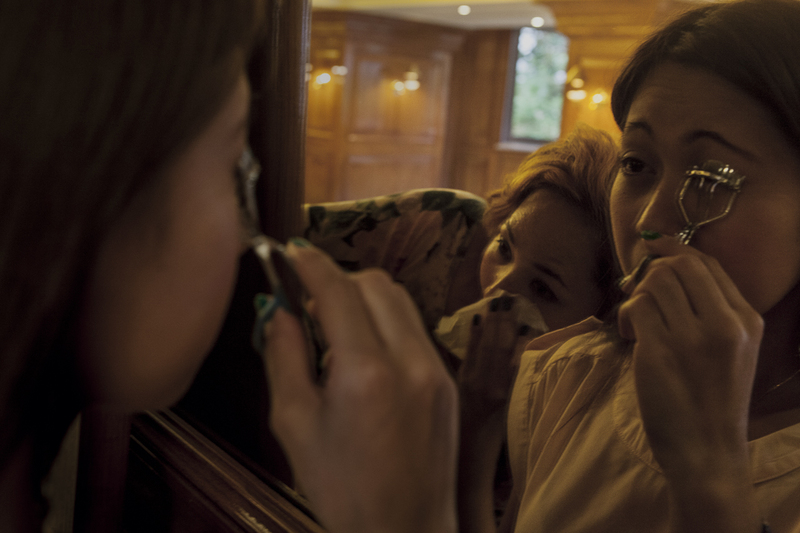 In the Philippines, Bella used to sew clothes for her 3 children. She sees the competition “Trash to Fashion” as the opportunity to showcase her talent. She must make 3 outfits from waste and parade in them. Here, she is practicing her choreography for the event. For the past month, Bella has been spending her Sundays preparing for a fashion competition organized within the Filipino community in Beirut. She pays the equivalent of two months’ salary to participate. 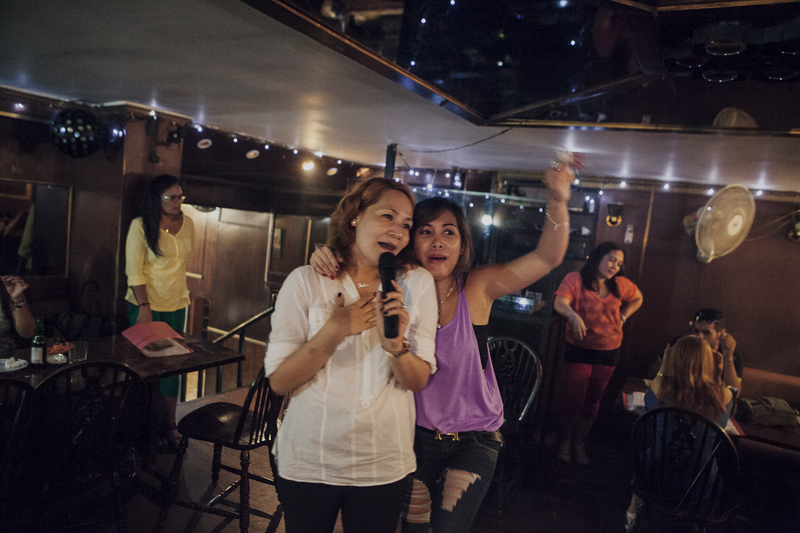 Every Sunday afternoon, the Pronto, a karaoke bar, fills with Filipino domestic workers. They sing tunes from home under the leering gaze of Syrian, Lebanese or Egyptian men. 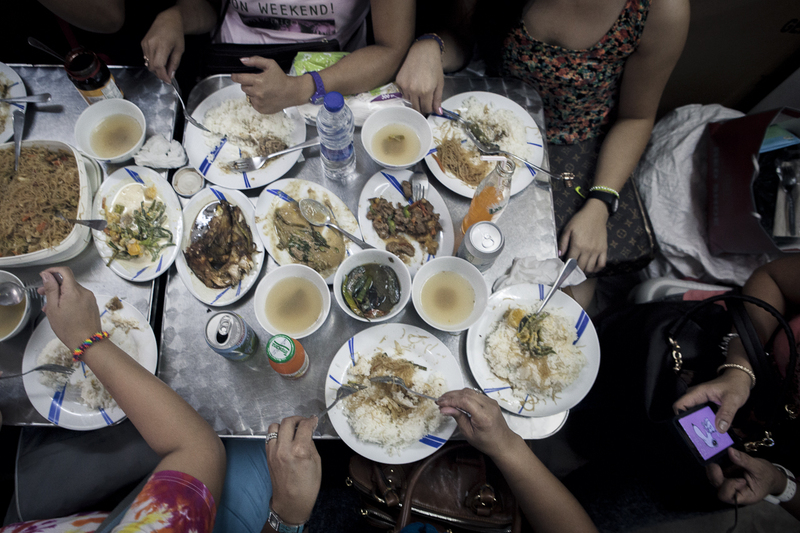 The Pronto is a place for rapid and fleeting encounters between migrants of all genders. Talking about the fate of these workers ensures that they won’t remain in the shadow of the law. At a time when convention 189 on domestic workers has been adopted by the International Labour Organization, it serves as a way to remind Lebanon of its obligations. 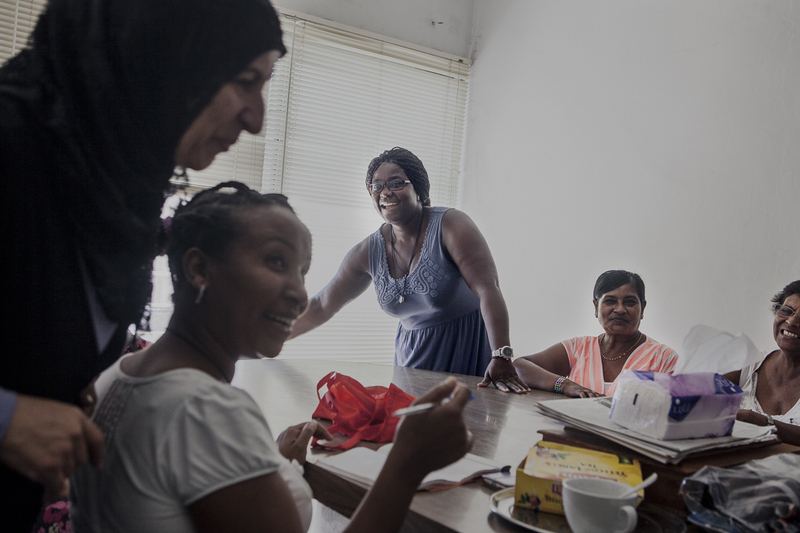 Finally, it is a way to support the fight which they lead through, in part, the domestic workers’ union that was established in Lebanon in January 2015. 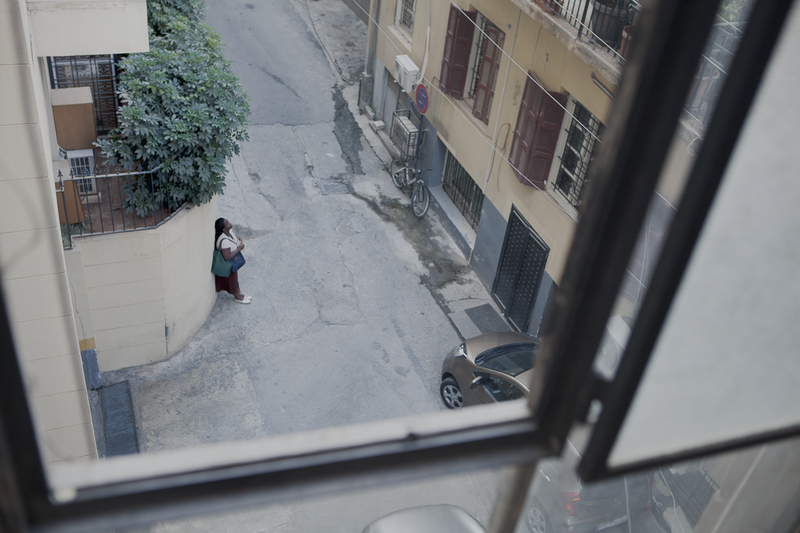 Adrienne’s photo essay reminds us that behind each migrant domestic workers is a woman with a personal history that began long before her arrival in Lebanon and that she is much more than a housemaid or a cook. Showing Filipino ladies organizing fashion shows on their free time speaks of their aspirations. They want to prove that they are capable of much more than scrubbing the sink. And, that it is unfair to see them merely in terms of the work they do. In telling their stories as mothers, lovers and migrants, Adrienne also helps anyone who sees her images relate to these women’s lives. 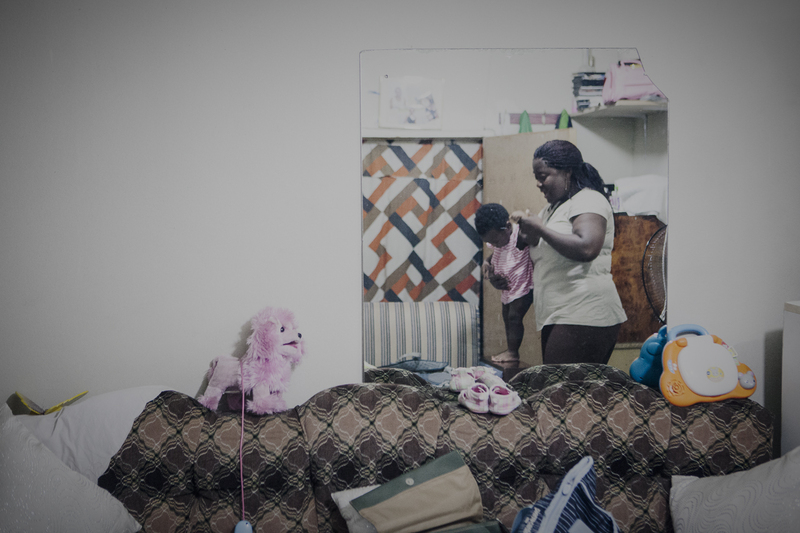 In this sense, Adrienne enriches the discourse about who these domestic workers are. It portraits them in another light than that of the pathetic victim or the docile servant. It’s both a unique and humanist document. Adrienne Surprenant is a freelance photographer based in Montreal, Canada. After studying photography at Dawson College, she spent several months in Nicaragua working for the NGO “Alternatives”. Once her mandate was over, she completed a photo essay “Waiting for the Canal” that was exhibited at Visa pour l’Image in 2015. 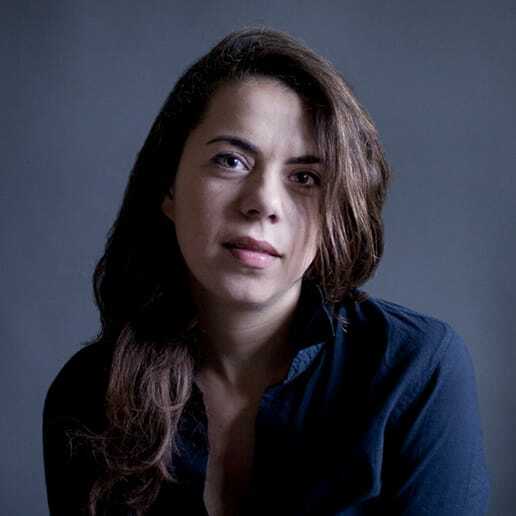 Her images can be seen in El Pais Semanal, L’instant Paris Match, la Presse+, The Globe and Mail, Le Devoir, Montreal Gazette, La Croix, Journal Métro, Ricochet and Narrative.ly. 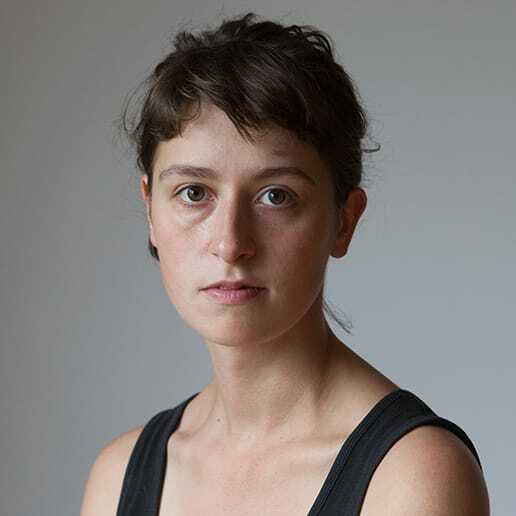 As of January 2015 her work is distributed by Hans Lucas.